UD-GenoMed (UD-G) was established in 2007 as a university-based innovative R&D company. Partner UD-G offers large scale cell-, molecular- biology and clinical genomics services, consulting and training for academia and industry. Its services are based on the unique know-how in the fields of clinical study coordination, sample collection, biobanking, data interpretation, clinical and molecular data integration. The Ophthalmology Research Unit led by Dr. Petrovski is extensive experienced in the biology of ocular stem and epithelial cells and is dedicated to standardised isolation, cultivation and characterisation of primary cells from the human eye; in particular, retina- and iris- pigment epithelial (RPE / IPE) cells and includes experienced ophthalmologists / scientists from the departments of Ophthalmology / Biochemistry and Molecular Biology, University of Debrecen (O / BMB UD). The cell and molecular biology laboratory of UD-G is equipped with state-of-the-art instrumentation for extensive in vitro and in vivo safety and efficacy analyses, validation and immunogenicity studies, as well as quality control. UD-G contributes to WP3, which comprises the validation of parameters, quality and quantity control of starting material (autologous cells) and optimisation of the transfection procedure and leads WP7, which includes the definition of all necessary SOPs and in process control steps for the gene transfer system. In addition, UD-G will contribute to the in vitro and in vivo safety studies in WP6 and will disseminate information resulting from TargetAMD. Dr. Goran Petrovski, MD, PhD and biomedical engineer (Wright State University, USA) holds an MD degree and PhD from UD, Hungary. Currently, he is leader of the Stem Cells and Eye Research Laboratory, ophthalmologist and PI of several projects at O / BMB UD. Over the last 3 years, Dr. Petrovski has developed a robust stem cells program in ophthalmology, in particular retina and cornea stem cells that has received numerous national and international acknowledgments as well as funding (Pfizer, OTKA). He is one of the coordinators of the Cornea Bank at UD. 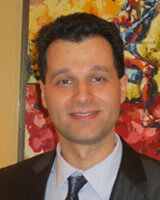 In the clinic, he works mainly on medical retina. 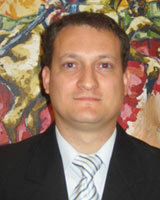 He is a scientific advisor of UD-G and a leader of this project.